I cleaned out my fridge today because it’s garbage night (as you do) and I decided to mix some random things together and out came this lovely and delicious summer smoothie concoction. I have a cornucopia of awesome veggies hiding in my crisper as a result of my participation in a CSA (community shared agriculture). If you aren’t already participating in a CSA, I highly recommend it. It’s a great way to get local, seasonal, grown by organic practices vegetables at a reasonable price. It’s also a great way to support your local farmers and enjoy the fruits of their labour. As much as I love the local, delicious seasonal vegetables…Im gonna be honest…I’m not a giant kale fan. It’s ok if I hide it in things. I’ll eat it because I know it’s good for me…but I wouldn’t ever really jump up and down and get excited about the chance to eat kale. So I relish a chance to hide it in things so I’m getting my nutrient dense, amazing greens, kale goodness without having to think about the fact that I’m eating kale. The sweetness of the berries and the smoothness of the avocado, along with the electrolyte goodness of the coconut water are the perfect disguise for kale. Check out the summer smoothie recipe below and enjoy! 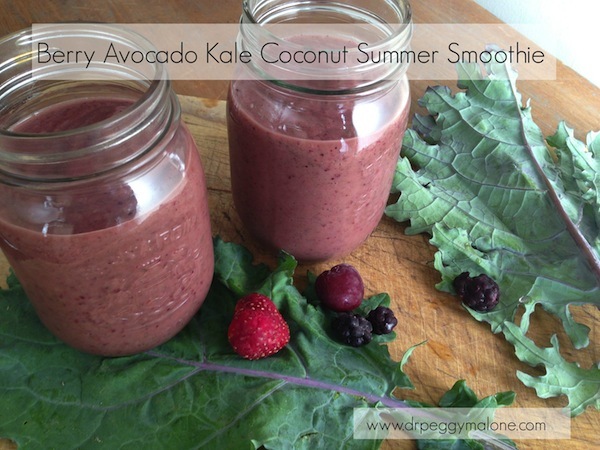 A delicious berry avocado coconut disguise for kale. Mix all ingredients in a high speed blender and pour into your favourite drink glass.